The question of how to drain a toilet perplexes many homeowners, and with good reason. This fixture has water flowing through it all the time and is connected to a very large drain pipe, but it's not built with a system for getting all of the water out of the bowl—or even the tank. The best method sometimes depends on whether the toilet is stopped up or not. When emptying a toilet bowl, it's important to get all of the water out of the trap (a cavity just beyond the hole in the bottom of the bowl that contains water at all times). You can usually empty the trap through the hole, but in any case, be aware that there might be residual water inside the base. The first step to draining a toilet is to turn off the water supply and flush. This removes most of the water from the tank and the bowl. However, you should do this only if the toilet is not clogged. Locate the shutoff valve (usually with a football-shaped handle) on the waterline below or behind the toilet. Turn the handle clockwise until it stops. Flush the toilet, holding down the flush lever until the tank is as empty as possible. Sponge out the remaining water in the tank, if desired, then use one of the following techniques to drain the toilet bowl completely. Plunging helps remove the water from the toilet bowl whether it is stopped up or not. The plunging motion pushes the water out of the bowl, through the trap, and down the drain. Shut off the water supply to the toilet by closing the stop valve located on the water line below or behind the toilet. Plunge over the hole in the bowl to get most of the water out of the bowl. Gradually flush the water from the tank into the bowl. Once you've depressed the flush lever, you can stop the flow of water from the tank by pushing down the flapper, the round rubber trap door at the bottom center of the tank. Plunge again, as needed, to remove the remaining water from the bowl. Siphoning requires a short, flexible hose that you don't mind getting dirty. This is also a good job for rubber gloves because you have to dip one hand into the toilet water. This method is effective only if there is no paper or other material in the bowl. Fill up the hose completely with water from a sink or tub, then plug both ends with your thumbs so that no water escapes (this allows air in and breaks the siphon). Set one end of the hose into the toilet bowl, and direct the other end into a bucket so that the bucket end is lower than the bowl. Release your thumbs from both ends. The water will begin draining and will continue as long as you keep the bowl end submerged in water and keep the bucket end lower than the bowl. A cup or small bowl works for bailing water out of a toilet bowl. A small cup or even the cap from a can of hairspray or spray paint can reach low enough to get the majority of the water. The cup should be able to reach into the hole of the bowl to empty water from the trap. A large, absorbent sponge removes all of the water from a toilet bowl and tank surprisingly quickly. It fits around everything in the tank and down into the bowl to remove the water from the trap. Wear rubber gloves and squeeze the sponged water into a bucket. 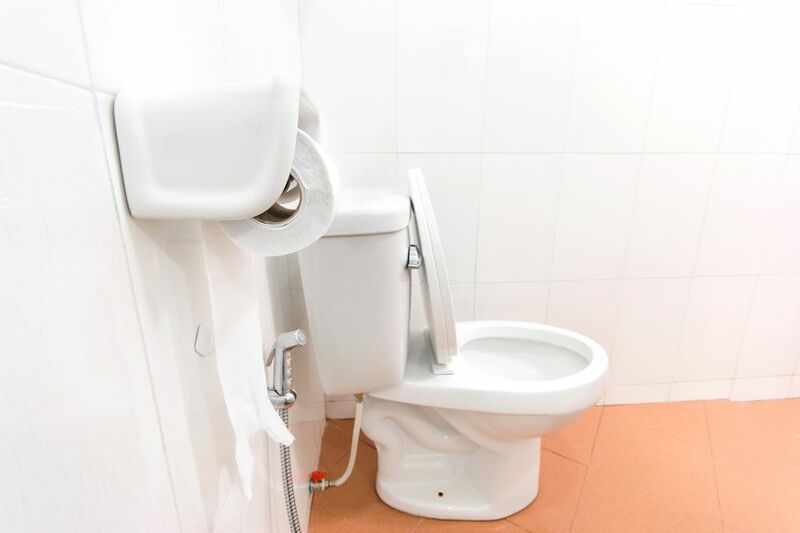 A wet-dry vac makes quick work of draining a toilet but is recommended only if the toilet water is clean. Make sure to remove the filter in the vacuum (to prepare it for "wet" mode) and be careful not to overfill the vacuum bin with water. You don't want to go sloshing through the house with a heavy bin full of toilet water.